[s]Welcome to Pet Friendly's newest community! The quaint little village of VerdeGrove awaits you! Please read all of this first post and understand the rules before applying. When making your character sheet please choose a color for your characters Dialogue and thoughts. Provide the code at the end of your sheet and make sure it isn't already being used. Stepping into VerdeGrove is like taking a step into a simpler time - though that doesn’t mean they are behind on in ages! They have electricity, water, plumbing, etcetera just like every other small town. Just here, everyone knows everyone else in this rustic little community in North-Eastern America. The actual village is small, as one would expect. VerdeGrove is surrounded by dense forests and located away from all large cities. The terrain is slightly mountainous and rich with vegetation and water-sources. Its main income comes from the local farms and ranches, though plenty of little “mom-n-pop” shops can be found within. As far as houses are concerned, there is a wide variety ranging from large old farm houses all the way down to shanty little shacks. Every character has their own color when they talk in order to make it easier to tell them apart. All main characters will be listed here (human or animal), along with a link back to their main profile. ------> AS OF NOW, WE ARE SUPER FULL! These are all important, so know them well and memorize them if you are going to be apart of this neighborhood. They are here for a reason. - There are 10 character slots. This only pertains to MAIN characters. Non-player characters are fine. That typically includes humans and other people around the village. I’d like to keep this place rather small... If you have a problem with that, there are plenty of over-crowded neighborhoods still accepting. - You may have 2 characters. Though, to be honest, it has to be really good and you have to prove that you can keep them both up and give them both the same amount of character development. I wont stand for two shallow characters. - Listen to others. If someone has a problem with something you do, be reasonable. Considering how small the town is, people will probably know each other. Go along with “stories from the past” they tell. I’d like this to be a democracy, but I’m not against being a dictator if I must. - Keep up in the OOC thread. It’s important to me. Get over it. 1. If someone wants to join the neighborhood, they need to post a sheet in the Main OOC and then come in here and post it. Just because you post it in both places does not mean it’s accepted. 3. Your sheet and color will then be evaluated and rejected or accepted. If I reject it I will tell you what to do to get accepted. 4. I will not hesitate to reject you, so make your characters good. Put some actual thought into them. Don’t make them one-sided, but at the same time I really don’t want super complexity. I want characters to be believable. 5. After we reach our 10 profiles, I will NOT accept any more. I’ll be happy to put you on a waiting list for if anyone drops out, though. 6. I will accept reservations for while you work on your profile if we aren’t full yet. However if I deny your character (not just request a little bit of tweaking), you will lose your slot and start at the back of the line. It’s not my fault you didn’t try. - Pets are treated like sub-humans… They are treated decently enough, but are not really respected. Pets can be paid for jobs (though at reduced wages), and are often allowed to eat “people food”… This may vary based on pet-owner. -All pets have rights. Whether or not their fully respected or not depends on the open-mindedness of the human. However, there really aren’t any set laws for pets, other than preventing animal abuse. Animals accused of crimes are typically at the mercy of the local judge, who happens to be pretty open-minded and fair when it comes to Pet vs. Person. - Considering VerdeGrove is such a small community, there are no leash or collar laws. However, animals without a collar tend to be viewed as feral. - Ferals are treated as pets without an owner, though most people of the village tend to be rather leery and distrusting of them. - Owners don’t have a certain way they are required to act. Personality and values vary from person to person, and thus shall it be here. - VerdeGrove is a small place, so most everyone knows everyone else. Though, despite its size and shelteredness from the world, it isn’t a hick town. Just peaceful. - If you have an questions, then ask them. I’ll be happy to explain further. Or if need be, make it up on the fly! Ha ha! Housing: The houses vary in size and location. 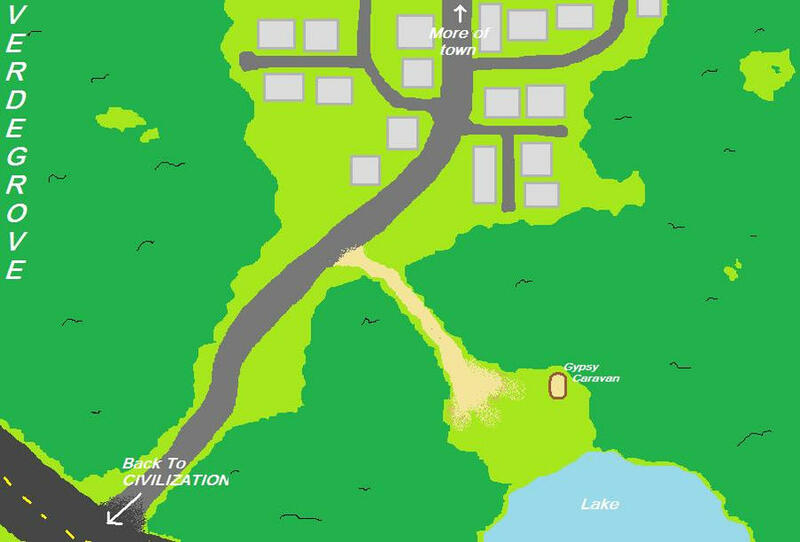 They can be in the main part of the village, or back a bit in the woods. It really doesn’t matter to me. Just be reasonable… VerdeGrove villagers tend to look down on things out of the ordinary. Stores: If you plan on having your pet's owner (or the pet) own a store, please make a simple layout of the building and have a list of products. Listing general pricing would be helpful too, but not necessary. Put the layout and list of products in a post in the OOC and I will make an index for Stores. This way if people go to your store they know what you have and what the store looks like which makes it a lot easier to RP. REMEMBER! This is a small town. Don’t expect to find a Best-Buy, or even a WalMart. Everything is local! Laying-Out Your House: This will be very useful when other character's visit your house. Just make a blueprint of your house to give everyone a general idea of what to see. This really isn’t necessary, but it definitely will earn you some brownie points. Concerning the Canon: So if you didn't understand the Canon, simply put, the owners treat their pets like humans with a bit less respect. Think of it like the Civil Rights Movement, but not as offensive. Humans in general vary on how they treat their pets. If you still don’t understand, ask. I’ll be more than happy to provide an answer. Help with the Index: I won’t be indexing arcs or anything like that, but I will have a very brief recap of what everyone is doing in the role-play. If someone would like to add to the index, let me know and I’ll be happy to update these main pages. Your Character(s): Please note in your sheet whether or not they are moving in or already live in the neighborhood. I WOULD PREFER THEY ALREADY LIVE IN THE TOWN! If they're moving, state where they’re from - whether they're coming from a PF neighborhood or not. If your character already lives in VerdeGrove, you may want to talk to other people who have characters who already live their as well. Discuss whether or not they'd know each other. They don’t have to be friends or whatever, but they would at least know the other somewhat or know something about them. I really don’t want a lot of obscure animals living around the village. Remember! Normalcy is key! Let’s try to limit it to actual pets or such. I MIGHT let you slide on this, depending on your profile. Pet Activities: I honestly don’t care what you do as a pet (WITHIN REASON)! It’s a small town so you have to do something to occupy your time. Just remember there isn’t an abundance of technology around. Cell phones even aren’t all that common, and videogame systems typically mean you’re pretty financially well off! Try to go outside. There’s lots of woods to explore. Living and Stores: Just because you own a store doesn't mean you have to live in the second floor. You can own a store and live in a different house. Though, if you’d like to live in your shop, by all means I wont stop you. That's all I can think of for now. I will keep you all updated if I add anything else! If you have anything you think should be added, or that I didn’t clarify enough, let me know and I’ll see what I can do. Thank you for reading all of this~! I look forward to role-playing with you~! Last edited by LucidDarkness on Tue Oct 19, 2010 5:16 pm, edited 12 times in total. "Did you hear about what happened?" A month or so ago, two travelers set up camp in a clearing down by the lake outside of town. One of them is a little gypsy-looking maine-coone, the other is a gigantic tabby that just generally seems suspicious... So far they haven't caused any harm, so no look causing them trouble... Just keep an eye on them. Never can be too careful with those feral-types..
Other than that, nothing really out of the ordinary has happened lately. Lucid - Decided to go into town with Varialis to celebrate some new found wealth, but bumped into Flint and Danté. The four are now approaching the village. Varialis - Was spear-heading a zestful outing in the village for himself and Lucid when they met up with Flint and Danté. The four are now approaching the village. Flint - Started foraging in the forest for food when he was greeted by and convinced to go into town by Lucid and Varialis. He just met Danté for the first time. The four are now approaching the village. Danté - Was mediating on his special rock when he met up with Varialis and Lucid, who then convinced him to come celebrate with them. The four are now approaching the village. Cyrano - Took a break from his fruit stall to socialize with Brill. Ash and Flora soon met up and started talking with them. The four of them are trying to decide what to do. Alex - Has been wandering around in the woods with Abbie, looking for food and water. They have just made it to the lake in front of Lucid and Varialis' caravan. Abbie - Has been following Alex through the forest in their search for food and water. They have just made it to the lake in front of Lucid and Varialis' caravan. Brill - Went outside to eat lunch and started chatting with Cyrano. Ash and Flora soon joined in. The four of them are trying to decide what to do. Ash - Left his home for the day after reading a joke book and quickly met up with Cyrano, Brill, and Flora. The four of them are trying to decide what to do. Flora - Was tending to her garden when she decided to go walking. She bumped into Cyrano, Brill, and Ash while giving away flowers. The four of them are trying to decide what to do. It's crystal clear out, though there is a bit of a nip to the wind. Looks like Fall is getting here right on time. Last edited by LucidDarkness on Wed Nov 03, 2010 5:25 am, edited 4 times in total. Character will prob. be up by tomorrow sometime! Wears a ragged pair of pants with a hole in the back for his tail. Brown colored with Tan on his chest, around his mouth and eyes. Drawing of Flint by Lucid. Drawing of Flint by Souji. Flint is a happy go lucky type of guy that likes to spend his time in the forest. He is generally shy around others and also is very easily frightened. He is very friendly if you get to know him but might become a bit clingy because he does not have very many friends. He is not very good with trends of any sorts because he lives alone in the woods. Has a very care-free attitude because he does not have any duties he needs to fulfill. When he makes any mistakes against others, he usually beats himself up for it. He is also a pacifist of sorts and tries to avoid violence at all costs. Though having wings, he does not tend to use them all that often. Lives on a tree half a mile into the forest, the only thing that the tree has are two hammocks so he lives in simplicity. Does not have a owner. In the case that he is not able to find enough food for himself, he does minor theft. He is very good at picking locks and moving around sneakily and unnoticed. He does not take much in the case that he does steal, only like a single food item or product like a pack of band-aids. If he can, he tries to return the product after he used it. He has a fear of people licking him, he thinks of it as someone is tasting him and will run off without a second thought. Last edited by FlintTheSquirrel on Sun Dec 26, 2010 9:34 am, edited 3 times in total. I might join if I can think of a character..
Give me about a day to think of a character. If I can't, I won't join, but if I can, then I will! Soooooooo, there are only going to be eight characters in total? Ok, if my character doesn't have to own a store, I'd like to join this. Although, I'm yet to think of a pun yet for my character's name or characteristics. I'm gonna complete the square with this guy. Could I please reserve a place? Well, I didn't need a day! I've already thought up what I think is a good character, so can I please have a reservation? Anyway, Can I reserve a spot? Hey, if there's an open slot I would like to join this one. You know what.. heck. I'll kindly ask for a reserved spot Lucid. I've been wanting to do another RP and this seems like it'll work great with just a few people. Okay. I'll put in reservations for all of you in the order I got them. I expect this role-play to be literate... No offense, but I'm really not looking for weak posts... I'll look at past RPing experience if it's available and privately contact you if I have a concern. Flint, you're accepted. We've already discussed what all that needs to, anything else can be taken up with me privately. Last edited by Hypergenesis on Sun Oct 17, 2010 9:10 pm, edited 1 time in total. Asher's fur is like this. He's usually smiling so wide his tongue is lolling out of his mouth. His collar is green with a smiley tag. His eyes are dark green and smling. Personality: Asher is generally happy. He's one of those people that can cheer up anyone with his smile and kind words. He loves jokes, specifically knock-knocks and lame puns. His laughter has been described as "rich, real, and contagious". All Asher really wants to do is tell a funny joke or see someone smile. He may not seem too bright, but he's actually learning from just about everything- people he talks to, books he reads, TV shows he sees, anything! But sometimes, even when he seems happy, Asher is actually incredibly sad. He's not very close with his parents, so he's not sure how to tell them about how he feels. After years of keeping things to himself, it's become habit, and even when he does make a great friend he can't figure out how to tell them what's going on with him. -Asher's happy personality has caused a lot of controversy in his large family. Relatives-and sometimes even his parents- think his happiness is all a big joke, and that he's trying to butter them up for something he might do in the future. Because of this, Asher and his parents aren't very close. -After a while of not being able to change their minds, Asher gave up. He doesn't care what his family thinks of him, just what he thinks of himself, and that's really enough for him. -His parents, Anita and Anthony, both love him very much but have a hard time showing it (like Asher does). - Asher solves his own problems all in his head. he can lock himself up in his room for hours trying to sort things out. STR- 6 "I can lift that!...maybe..." PER- 6 "Are you sad? No? Oh, you looked sad." END- 5 "...just...go on with out me..."
CHA- 8 "Do you want to hear a joke? It's really funny and I know you'll just love it!" INT- 7 "Pi equals 3.14 something something something." AGI- 5 "The finish line is too far away and I don't feel like getting there." LUCK- 5 "My lucky number is 13...wait that's not lucky?....oh." Question...How Literate are you asking for? Has dark silver fur around the majority of his body, although the end of his tail and the tips of his ears are white. He wears a white collar, with a silver ring tag. He found this tag awhile ago, and it sparkles when in the light. Brill has a habit of overestimating himself. His ego is bigger then most as well. He’s still a friendly pet, and happy to join anything. He’d help anybody in trouble, even if it was a complete stranger. He may challenge anyone to prove his own skill. He’s no jerk though, but he can be a bit of a sore loser. - He has a habit of winking at people to apply what he means. - His owner (David Hourder) owns a jewellery store, and he lives on the second floor, sleeping in the same room as his dad. He’s lived like this for quite some time now. PER: 5 “I'm not bad, but not great"
Cyrano sports the usual silverish blue all Russian Blue's have. He almost always has a bright smile on his face, and almost always carries around a light blue scarf. The scarf usually covers his collar, which is in comparison a dark blue. his eyes shine brightly in the daylight, considering there a very light grey. Despite his current situation with money Cyrano is almost always happy. Its as if his life were a dream. And that he would wake up any second. You can almost always catch him humming a cheerful tune, while working on his dads farm. He has a rather high pitched voice, and at first you would say he was probably on catnip. He has a "work harder" attitude, and is almost always willing to run a errand or job for you. Cyrano was born, raised up, and has always worked in VerdeGrove. His dad owns a farm just outside the main portion of Verdegrove, in which Cyrano works a few hours a day. However, he used to have a brother, about a year younger and just as hard a worker as Cyrano is. A few winters ago when Cyrano was about 2 years old His brother walked out onto the frozen lake, chasing a snow rabbit. Cyrano ran after him, risking his life going out onto the ice too. Unfortunately Cyrano could not reach his little brother in time, the ice broke out from under him, Cyrano watched in terror as his little brother disappeared under the ice, He dove in after him, and by this time the dad had already reached the site. Next thing he knows he woke up in a hospital bed, still shivering from the cold water. His dad was sitting by the bed, and thats when he recieved the bad news. Almost everyone in the small town heard about it, and for a few days after Cyrano went into a sort of depression, not working and staying in his house asll day and night. eventually he started to regain his confidence, and began going out again. Cyrano never learned to read, and is not that well educated. His fur is always scraggly and his scarf is a little worn out. If theres one thing he knows, its working. and the value of the dollar. Him and his dad is poor, almost to the point of no food, which makes him humble. He sometimes eats out of the pig food when he gets hungry enough. His father is really loving, and teaches Cyrano principals and other good stuff to know, such as manners. They dont get Cable, or satellite, or internet. Every morning, from 5:00 - 8:00 he stays at his small kiosk in the middle of town, selling fruits/veggies occasionally he's let off to go play when his dad takes over, but he seems content standing there. Last edited by Zander on Sun Oct 17, 2010 8:50 pm, edited 1 time in total. Things in RED apply to everyone. Neko: You're accepted. We spoke privately about how that will work out. Game: I have to give it to you... That profile has got game! Pun fully intended. I'm accepting you, but I'll ask you to make sure you're getting on the IRC for this, if nothing else but to socialize a little. Make sure you keep up to date with everything. Zack: The fact you asked that makes me nervous... Lol!! But yeah.. The more literate, the better. 44RON: Accepted.. Just a word of advice from looking at your past posts, try to give them a bit more attention. Definitely separate speech/thought from the rest of the text (pet-peeve, sorry). If it's a one-on-one chat between two characters, can we bring it to irc so we don't surpass the three post per day limit? Yes, one-on-one chats should be brought to the IRC. A final conversation is then posted at the RP to avoid any lengthy delay of waiting for replies. You can bring stuff over from the IRC if you'd like. It really doesn't matter to me. I was just saying that I'd really not like for the story to get really far ahead of everyone else. Personality - TRIES to be Wise and intellectual. Tries to understand as much as he can, aswell as people. (This is the way he acts, wants to be. He's actually quite childish!) His temper is quite high so getting on his nerves can be hard. - He usually has the hood up aswell, to add a bit of a mysterious look. - If someone is on to him, he'll most likely giggle and starts spazzing. - He's fluent in swedish, speaking reading and writing. - His book that he carries around is some sort of older swedish book. STR - 4 "I'm no heavy-weight lifter." PER - 8 "Eyes.. everywhere!" END - 4 "Enough to run and hide." CHA - 6 "Very well, my lady." INT - 8 "These books of mine are said to belonged to Merlin himself." AGI - 3 "I don't do agility." LCK - 7 "You could call me lucky." Last edited by Tiggy on Tue Oct 19, 2010 9:04 am, edited 3 times in total. I'll be honest. I have absolutely no idea what you mean. Please could you give me an example or something? Check out the first posts. Speech is bold and in a different color. It stands out against the text. -Appearance- Mina has very soft fur, that is long for a fox. She has the normal fox markings of red on the back, upper legs and arms, head, and tail black on her legs and arms, and white on her belly, chest, muzzle, and tail tip. She has her fur dyed so that where the colors meet, they look like they're swirling around. She wears various colored ribbons on the back of her neck and on her tail. She is an absolutely gorgeous fox, having won awards and some pet beauty pageants. Mina is very optimistic and loves to look at herself in the mirror. Some would call it narcissism, but she thinks of it as just taking care of herself. She has a positive outlook on life, especially because most things go her way. She is slightly spoiled, but her owner tries to help her be more charitable and giving. Mina really enjoys how she can use her good looks to get most things she wants. She knows how almost all humans thinks she's cute, and how a lot of guy-pets think she's beautiful, so she loves to take advantage of that. Hidden under her perfectionist, and better-than-you attitude, is a very strong care for those in need. Despite her neat-freak tendencies, she has a very strong interest in ferals. Mina is a neatfreak, and hates to get so much as a speck of dirt on her fur. Mina enjoys giving other girls makeovers.